This week’s Monday Music Quote brings this segment back full circle to week one. My very first installment included a quote from Plato, and following that, we immediately ventured into the concept of “the soul.” I honestly cannot say that I have ever heard a more perfect definition of music than the one above. “…the movement of sound to reach the soul…” provides a vivid and tangible, yet divine, prospect. Then we have the kicker, “…for the education of its virtue.” This is truly a powerful statement, that music actually provides education for the soul implies that music makes the soul better; teaches it ideas and concepts of which it was not yet aware. We think of “the soul” as something deep within us, inside which we already know things that our brains and bodies do not yet understand. That music can actually teach this part of us and enhance it is an absolutely wonderful concept. 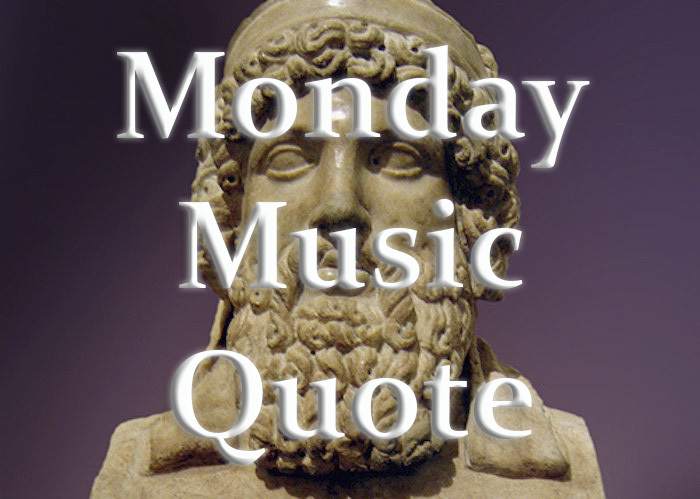 This entry was posted in Monday Music Quotes and tagged Monday, Monday Music Quote, Music, Plato, Quote.